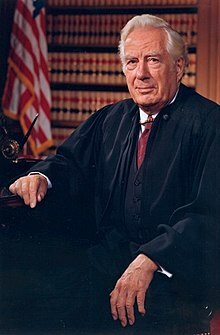 Warren Earl Burger (September 17, 1907 – June 25, 1995) was the 15th Chief Justice of the United States. He was in office from 1969 to 1986. Although Burger had conservative leanings and was considered a strict constructionist, the U.S. Supreme Court delivered many of the transformative decisions on abortion, capital punishment, religious establishment, and school desegregation during his tenure. Burger was born on September 17, 1907 in Saint Paul, Minnesota and studied at the University of Minnesota and at William Mitchell College of Law. He was married to Elvera Stromberg from 1933 until her death in 1994. They had 2 children, Wade Allen Burger and Margaret Elizabeth Burger. Burger died on June 25, 1995 in Washington, D.C. from heart failure and was buried at the Arlington National Cemetery, aged 87. Warren E. Burger memorial at Find a Grave. This page was last changed on 1 October 2014, at 00:26.